Registry - parents were Korean Kennel Club registered. PoongSoon was born in the U.S. out of parents imported from Korea. 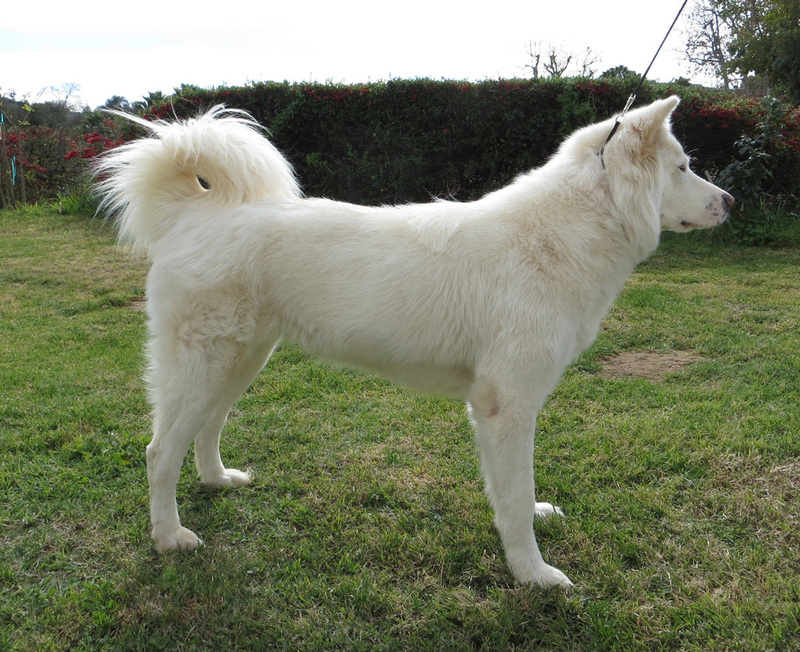 Her lineage is said to be through China, and like many of the dogs from China, she is on the larger size range. PoongSoon is friendly towards all people and other dogs. She loves just being around the company of other dogs during social gatherings, and is often reluctant to leave if there are still dogs around. She is an easy dog to keep despite her size. She is non-argumentative with the other dogs in the home including several foster dogs. She also has little to no interest in escaping from the yard - a trait seems to be typical of the China-line dogs in California. PoongSoon will guard her property, but her guarding threshold is much higher than a Jindo's. It would take a coyote or a person trespassing on the neighbor's property to trigger her serious barking with hackles fully up. As of Mar. 2017, PoongSoon has not had a litter yet and so she will probably not be bred as it is usually hard on a female to have a first litter at a late age. I may look into freezing her ovaries/eggs if the technology is available for domestic dogs. Completed Puppy Socialization Class at Beckman's. Completed Puppy Beginners at Hidden Valley Obedience Club (HVOC). Earned the American Kennel Club STAR Puppy. Earned the American Kennel Club Canine Good Citizen certificate. Caught a gopher while on a walk. Started first agility class at Dog Quest Agility. Caught a gopher in the yard. Passed the elements of the AKC Community Canine Good Citizen test.